Afzal has a great eye for capturing the ordinary and not-so-ordinary glipmses of Lahore. 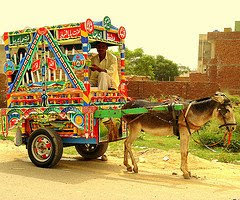 Here a traditional donkey-cart, now disallowed on the main roads, is decorated with much love and meaning. The names of Allah and the major saints of the subcontinent have been painted as good luck charms. Lahore Nama will feature her photos on this space.Watch out for more..